Published: Oct. 9, 2013 at 01:35 p.m. 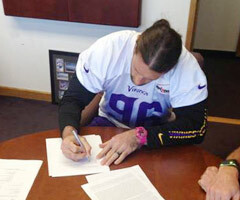 Updated: Oct. 9, 2013 at 11:00 p.m.
Brian Robison is the rare player to sign a third contract with the team that drafted him. And he's done it in less than seven full seasons. The Minnesota Vikings announced Wednesday that Robison signed a contract extension. NFL Media Insider Ian Rapoport reports the deal is a four-year extension worth up to $28.3 million with escalators for sacks (in the ballpark of totals Robison's recently posted), per a source involved in the deal. Robison also earned a $5 million signing bonus and $13.1 million guaranteed, Rapoport adds. The deal averages $6.65 million over the first two years and $6 million over the final two years. When Robison signed a three year, $14.1 million deal with the Vikings in 2011, he was a relative unknown reserve set to take Ray Edwards' starting job. Minnesota was criticized for the decision at the time, but Robison turned into a rock solid defensive end opposite Jared Allen. Edwards now is out of the NFL, and we'd argue that Robison is the best player on the team's defensive line. Robison was chosen in the fourth round of the 2007 NFL Draft by Brad Childress' regime in Minnesota, and he's outlasted most of his teammates. If the Vikings' move to pick up Josh Freeman at quarterback doesn't pan out, it wouldn't be surprising if Robison outlasted the current regime in Minnesota, too.